Today I ran the goods lift at Temple Basin, and then later in the afternoon skinned up to Temple Col. All day I chatted to friendly like minded people(most of whom I vaguely recognised). Then I skied down and dropped into the lodge to chat to folks about their day. I just thought to myself ; This is such a cool friendly happy place. What if there was an INDEPENDENT review of what ski fields are really like? And what type of person would really enjoy which particular fields? So the idea was born... The New Zealand Ski Field Review ... By Snoel. So what would this review have in it? Well, this got me thinking also. Whats the most important factor? Prices versus facilities? Lift ticket costs? Seasons passes? Discount rates for families, single adults and children's ages. For example as a family often it makes a huge difference costwise if under tens ski for free, as I found at Porters a couple of years ago I could take my three kids and only pay for myself (which I didn't cause I just skinned) So yeah the days we had there were free! (Thanks Uli). As an Ex husband/ holiday dad/ partner to Julie / but often skiing alone/ I can view these skifields from a few different angles. For example for me Porters is great, cause you pay a $10 single ride lift ticket and ski the backcountry for the rest of the day. Whereas Julie loved the facilities at Coronet, cause they were friendly and chatted to her(while I was off skiing the backcountry)so for her facilities are more important. Also Ruby (my eight year old daughter) loved Cheeseman because they had a few really cheap lollies that she could afford with her pocket money. Often ski fields are too expensive for eight yearolds! (not cheeseman though - she skied for free and ate raspberry licorice until the money ran out!). I think back to my days in Southland skiing the fields in Queenstown - If i'd only known about how good clubfields were back then - ! And one last thing a review should have- the good, the bad and the ugly! Sounds like fun. 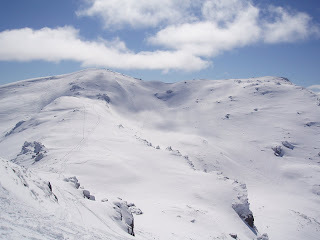 So Snoels New Zealand Ski field Review!!! What I thought I'd do is start with the five fields that are so close to me and work my way to the others as the opportunity arises. Watch this space!! !